We have some brilliant news that we can finally share with you…. 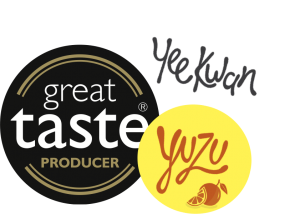 our brand new flavour YUZU SORBET has been awarded 3 stars in the 2017 Great Taste Awards! We are over the moon that we have been chosen as an award winning producer for the 5th year in a row..lets take a little look at our Great Taste journey. This is a perfect palate cleanser, a beautifully made sorbet, with an interesting and unusual taste. We found the taste to be somewhere between grapefruit and mandarin, very refreshing with a great texture. A very fresh mouthful of citrus. Clean and tangy with some subtle hints of floral – almost perfumed – there is a mix of lemon/orange/grapefruit characters all combined in the yuzu juice. There is a perfumed blossomy note which we like – a smooth sorbet – very cleansing. Very smooth textured sorbet. We love the bitter edge alongside the fruitiness of the yuzu. Extremely pleasing and easy to eat. Light and fragrant. A lovely soft, light but almost creamy texture. Really refreshing. Packed with lovely sharp citrus flavours.